Tulsa Drillers coach Mike Coolbaugh died Sunday night after being struck in the head by a line drive as he stood in the first-base coach's box during a Texas League game with the Arkansas Travelers, police said. The game was suspended in the ninth inning after the 35-year-old Coolbaugh was struck by a hard-hit foul ball off the bat of Tino Sanchez and taken to Baptist Medical Center-North Little Rock. "It's a tragedy for all of baseball," Drillers president Chuck Lamson told the Tulsa World in a story posted on the newspaper's Web site early Monday. "He just joined the staff and was a former Driller player. Our thoughts and prayers go out to his family." Travelers spokesman Phil Elson said Coolbaugh was hit on the right side of his head or on the forehead — "I'm getting conflicting reports," he said — and fell to the ground immediately. According to a report on the Drillers' Web site late Sunday, Coolbaugh was knocked unconscious and CPR was administered to him on the field. Sgt. Terry Kuykendall, spokesman for North Little Rock police, said Coolbaugh was still alive when he was put in an ambulance, but stopped breathing as the ambulance arrived at the hospital. "They tried to resuscitate him, but he was pronounced dead at 9:47 p.m.," Kuykendall said. Coolbaugh played 44 games in the major leagues for the St. Louis Cardinals and Milwaukee Brewers over two seasons. The Drillers' Web site said Coolbaugh joined the Tulsa staff on July 3 as a batting coach. He played for the team briefly in 1996. Tulsa is a Colorado Rockies affiliate. Aaron Rifkin, the Drillers' first basemen, said recently that Coolbaugh's coaching style had already been a help to the team. "He came in and didn't try to change guys, just fine-tune what they were doing. He's been great for me," Rifkin told the Tulsa World. A native of Binghamton, N.Y., Coolbaugh went to Roosevelt High School in San Antonio and was drafted in 1990 by the Toronto Blue Jays in the 16th round. He played third base and bounced around the minors for a decade, signing with the Colorado Rockies, Oakland Athletics and New York Yankees organizations, before making his major league debut with the Brewers in 2001. He played five more big league games for the Cardinals in 2002. He hit two home runs in 70 major league at-bats. Coolbaugh later spent three years in the Houston Astros organization. 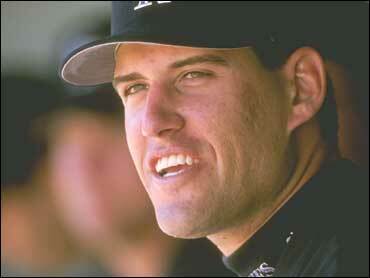 In 2005, he was named the Astros' Class AAA Most Valuable Player, hitting .281 with 27 homers and 101 RBIs. Coolbaugh's older brother, Scott, also played 167 major league games over parts of four seasons with Texas, San Diego and St. Louis in the early 1990s. The Travelers, an Angels affiliate, led 7-3 at the time the game was suspended with no outs and a runner on first in the top of the ninth inning. Officials said a date and time for finishing the game had not yet been chosen. Coolbaugh is survived by his wife, Mandy, and two young sons, Joseph and Jacob, all of San Antonio. Mandy Coolbaugh is expecting another child in October. Utah teen's suicide was a tragedy -- was how it happened a crime?